If you thought taking to the routes down the West Coast is pretty straightforward, you'll be surprised to find that there are actually an incredible diversity of twists, turns, sights and stops to have your holidays and weekend breaks sorted for years. With Cape Town as your starting point, SouthernXplorer has created easy itineraries depending on what you're looking for. Escape the crowds, get out of the traffic and enjoy the weather and neat little sights without going too far from Cape Town. So read on and find out how you can enjoy some of the best things to do mere hours out of Cape Town. Enjoy your country. Enjoy your province. The West Coast way. Start off with a morning stroll and run around the Witzand Aquifer Conservation Area. A highlight here must certainly be the Atlantis Dunes. Covering an area of roughly 32 square kilometres with white sand dunes reaching up to 50 metres high, this majestic, temporal landscape is soft and inviting. For the regular traveller, there are plenty of good exploration and photographic options if the weather plays along. On clear days, you can see Table Mountain off in the distance with the dunes being a mere 45 minute drive north of the Mother City. For those looking to enjoy some more adventurous pursuits, look no further as the Atlantis Dunes offers thrill-seekers a variety of different activities to get the blood pumping. From sandboarding, extreme off-roading to quad biking and dune buggy action - there is more than enough for anyone to enjoy an experience that will make you forget how close you are to the city. 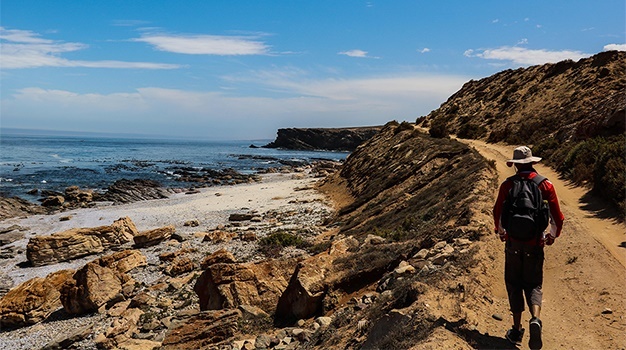 The San - the indigenous first peoples of Southern Africa - have found their voice at the new San Heritage Centre at !Khwa Ttu on the West Coast near Yzerfontein. This modern museum tells the San's own story - from the First Peoples of Africa to their myths to their first encounters with other groups - as well as share their culture, forming new relationships between visitors, community members and academia. A dream to build a self-sustaining centre where the San can pass on theirs skills, upskill and learn their heritage has its beginnings in 1999, when Swiss photographer Irene Staehelin bought a derelict farm. Over the last two decades, the farm has been converted into a space dedicated to the preservation and transmission of San culture via the younger generations. The !Khwa ttu San Heritage Centre is much more than a collection of artefacts and historical photos. It is a pioneering initiative that embraces the principle of community curation, led by San consultants from across Southern Africa and academics with exhibitions that stimulate and engage the body and senses, as well as the mind. The next stop on your tour of the West Coast should see you exploring the West Coast National Park and taking in the beauty of this part of the province. The most notable feature of the park is most certainly the Langebaan Lagoon with its inviting blue waters that lends itself perfectly to aquatic activities of all sorts. From racing around on jetskis, kiteboarding at speed, paddling on a kayak or just hanging out in the waves - there are many ways to enjoy oneself here. Roam around a bit, get comfortable in the sand or go exploring and see the landscape turn from sandy beach to salty marsh, where humans with their toes in the sand are replaced by flamingoes and other birds. A relatively short distance from the city of Cape Town and even closer to Langebaan, the town of Darling should be your next stop. For a town of its size, Darling sure offers a myriad of interesting attractions. This seeming speck of a town along the West Coast will surprise you. First off, check out Darling Brew in the main road. Africa's first carbon neutral craft brewery is a treat for the senses. With a selection of seasonal beers on offer, there is something for everyone. Beers with aromatic profiles of spicy coriander, clove and sweet banana and flavours like guava, litchi and grapefruit - this is the place that makes amateurs feel like a connoisseur and connoisseurs feel like family. This should be your next stop if you only see two things in Darling. Sometimes referred to as 'the most famous white woman in South Africa' (who isn't really a woman), stop by Evita se Perron at what is essentially just short of a shrine to comedian Pieter Dirk Uys' most famous character and the man's life itself. There is a small theatre and restaurant to check out if you have time before heading out on your way to your next stop or back to Cape Town.